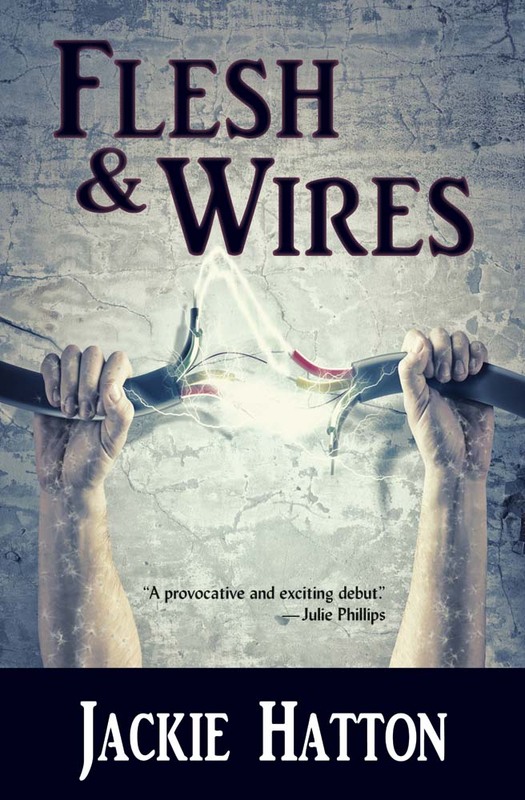 I'm pleased to announce the release of Flesh & Wires, a debut novel by Jackie Hatton, in both print and e-book editions. (Jackie read from the novel with other Aqueduct writers at the last WisCon.) Following a failed alien invasion the world left is sparsely populated with psychologically scarred survivors, some of them technologically-enhanced women. Lo, leader of the small safe haven of Saugatuck, find their technological enhancements put to the test when a spaceship arrives bearing two men with both wonderful and terrifying news. Is this the beginning of a new era of reconstruction — or the start of a new battle for survival? Not everyone in town wants to fight every comer. Not everyone in town shares Lo’s mistrust of outsiders. This is the story not only of Lo’s battle to protect the safe isolation of her unique community, but also of her struggle to come to terms with a constantly changing and uncertain world. Flesh & Wires raises questions about community, colonialism, immigration and basic human rights and challenges our assumptions about the ties and obligations of family, community and society in a crisis. You can purchase it now through Aqueduct's site.